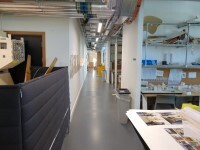 Services / facilities within the building include the Bartlett School of Architecture and architecture reception. To see more information on Student Disability Services please click here (opens new tab). Telephone Number: 020 7679 0100. Telephone Number: 020 7679 2036. To see more information on Graduate Admissions please click here (opens new tab). Telephone Number: 020 7679 7381. Telephone Number: 020 7679 6322. 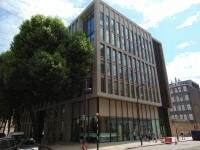 UCL is based in the Bloomsbury area of central London. 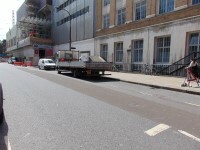 Most of the buildings are close to the Euston Road (A501), and are located within the Congestion Charge Zone. 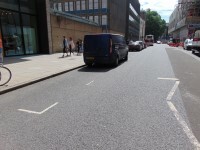 There is on street parking available on some of the streets in and around the UCL area. There are many bus routes that stop close to the University buildings. The following bus routes stop on Gower Street, outside the main gate:- 10 (Hammersmith Bus Station to King's Cross Station) 14 (Putney Heath to Warren Street Station) 24 (Hampstead Heath to Pimlico) 29 (Wood Green to Trafalgar Square) 73 (Victoria Bus Station to Stoke Newington) 134 (North Finchley Bus Station to Tottenham Court Road) 390 (Archway Station to Notting Hill Gate). 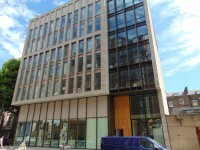 Euston, St Pancras International and King's Cross stations are close to the majority of the University buildings. However, all of the London Terminal stations are within reach of the campus using public transport. The closest tube stations to Gower Street are Euston Square (Hammersmith and City, Metropolitan and Circle lines), Warren Street (Northern and Victoria lines), Euston (Northern and Victoria lines) and Russell Square (Piccadilly line). There are many other tube stations in the vicinity of the University, including King's Cross St Pancras, Holborn, Tottenham Court Road and Goodge Street. 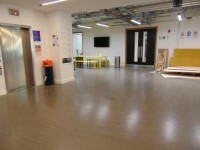 For more information on getting to UCL, please see the University Maps page of the UCL website. Please see the Transport for London website for more details on travelling to the University by bus or tube. The on street standard parking bay(s) is/are located on Gordon Street. This information is for the entrance located on Gordon Street. The width of the door opening is 181cm (5ft 11in). 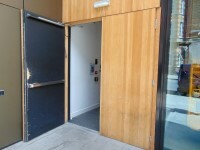 The doors are generally held open during warm weather. Building Reception is located beyond the main entrance. 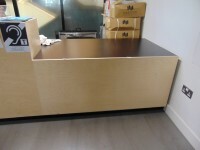 The desk is 8m (8yd 2ft) from the main entrance. 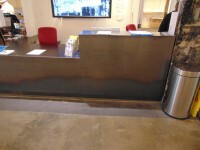 There are security barriers on the far side of the reception, which are 54cm and 90cm wide. There are fixed hearing loops are located in many rooms and studios throughout the building. You are on Eating and Drinking (Sodexo Cafe). Skip to the next section. The type of food served here is hot and cold snacks, salads and sandwiches. 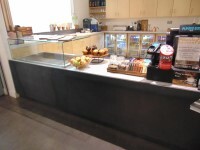 This café is located to the left as you enter, prior to the reception desk. There is a fixed hearing loop at this counter. 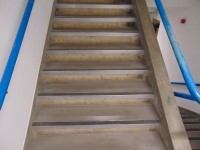 The floors which are accessible by stairs are B, G, 1, 2, 3, 4, 5 and 6. 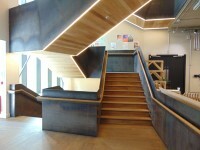 The stairs are located to the right after reception security barriers. 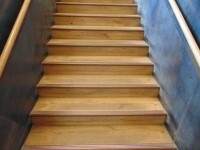 The stairs are approximately 7m from the reception security barriers. 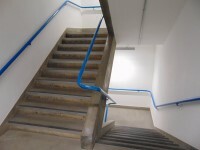 There is a similar staircase at the rear of the building, as shown in photographs 3 and 4. 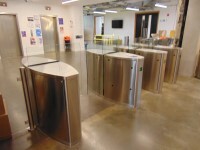 The lift is located directly beyond the reception security barriers. 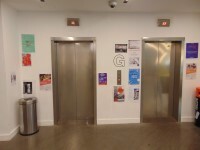 The floors which are accessible by this lift are B, G, 1, 2, 3, 4, 5 and 6. 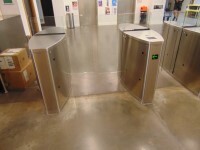 The lift is approximately 6m (6yd 1ft) from the reception security barriers. The clear door width is 87cm (2ft 10in). 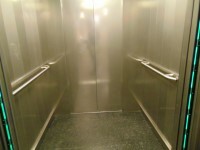 The dimensions of the lift are 156cm x 160cm (5ft 1in x 5ft 3in). 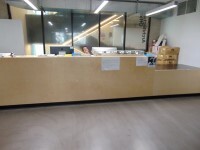 You are on Reception (Architecture Office). Skip to the next section. 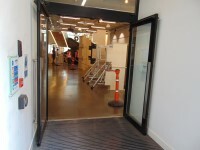 Architecture Office is located to the left as you exit the lift on the first floor. 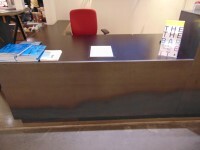 The desk is 9m (9yd 2ft) from the lift. 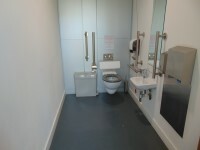 This accessible toilet is approximately 17m (18yd 1ft) from the reception security barriers. This accessible toilet is located to the right after the reception security barriers. 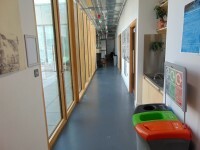 There are similar accessible toilets on all floors with transfer space on the left, as shown in photographs 3 and 4. 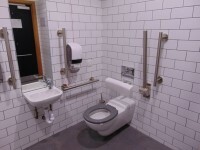 The dimensions of the accessible toilet are 234cm x 238cm (7ft 8in x 7ft 10in). 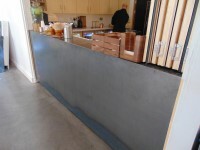 The lateral transfer space is 194cm (6ft 4in). 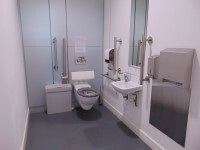 The basement floor accessible toilet was out of order at the time of the survey (06/2018). 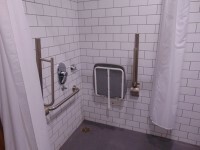 The accessible shower(s) surveyed is/are located in the ground floor accessible toilet. 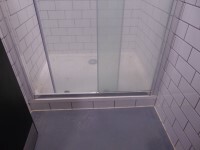 The facilities available in the accessible shower(s) include; handrails and a flip-down seat. 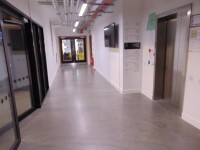 Other facilities available include; drop down rails and a pull chord emergency alarm. The toilet surveyed is located to the right beyond the reception security barriers. 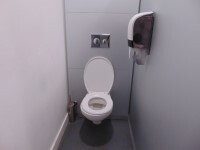 The standard toilet surveyed is approximately 12m from the reception security barriers. You are on Standard Shower. Skip to the next section. 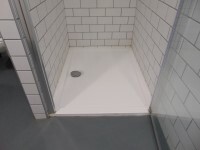 The shower(s) surveyed is/are located in the shared ground floor standard toilet. 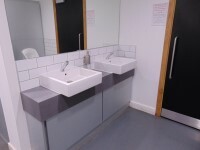 There is level access to the services from the shower facilities. 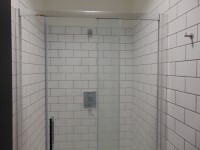 There is no signage on the door but the overhead sign marks this facility as an accessible shower. There is a 4cm step into the shower cubicle. 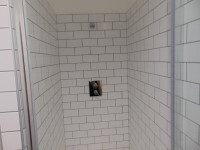 There are 2 similar showers on the basement floor opposite the lift that have a 20cm step into the cubicles, these are shown in photographs 3 and 4.